Ok, you have been talking about it long enough, it’s time to get more organized. Where do you begin? Well it all starts right here at your desk, take a look around. Is your desktop cluttered and jammed for space? Would you like to be more streamlined and efficient when you work? Make the decision right now to get more organized. We have some solutions for you to help you get started now. ​Let’s face it. The days of working on a single display computer system are over. It is more important than ever to get the most out of every minute during the workday. We are in an age of information overload, where serious multitasking is an essential part of any business. The first step in becoming more productive is to increase the amount of work you can get done in the same amount of time. The fastest way to get that done, is setting up multiple displays. 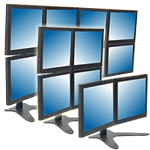 A multi screen computer system will allow you to expand from a single monitor computer to a very productive multi monitor working environment. If you are minimizing and maximizing windows all day on a single display, you need to stop. There is a better way. You can have a system with 2 to 12 independent displays depending on your needs and your mouse flows freely between all screens. Work with several applications open at once and increase productivity on the very first day. Which do you think will get more work done? Get those monitors UP off your desk! Multiple monitor stands will free up valuable desktop space, and create a very clean and organized desk. There are many mounts styles to choose from including freestanding and bolt down style bases. We have an unlimited variety of mounting arrays so you can have your monitors arranged just like you want them. 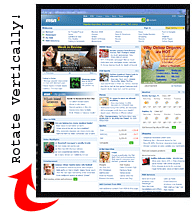 Another advantage of using monitor mounts i that you can rotate your monitors. If most of your work is done online, or you read long documents consider rotating your monitors in portrait mode. Think about it. Your monitor is wider than it is tall. So by rotating vertically, it substantially cuts down on the need to constantly scroll down the page.